France Trampoline has a large range of Pro One professional trampolines, designed for use an our AERO battery of trampolines. They are destined for recreational professionals but can also be used for individuals that want top of the range trampolines. 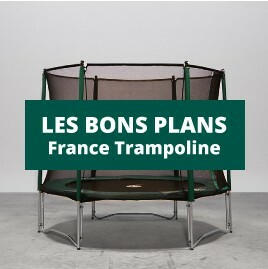 They are perfect for all ages and an adult will also be comfortable on this trampoline. Equip yourself with one of our Pro One trampolines ! The Pro One trampoline is available in two sizes: 265 x 265 cm or 365 x 265 cm. The solid framework, made of rectangular tubes, certifies the professional use for these trampolines as round posts are used on recreational trampolines. These trampolines are provided with an enclosure which meets European standards. The enclosure is held in place by 6 posts, joined together by a steel framework. Thanks to a hinged door, this strong net provides optimal safety for its users. Pro One Trampoline There are 2 products.